First of all, Maurice’s has great pants. I’ve said it a million times, I think. They have great fit, they wear and wash well, have lengths from x-short to x-tall (not available in every style, but still, that’s a big deal! ), and they’re not ridiculously priced. I just love them! These skinny knit pants are just fabulous. They are like leggings, but better. They’re thick and stay put and look like pants. The lace front tank is so cute and could be worn with a cardigan, jacket or blazer over it, or even by itself. 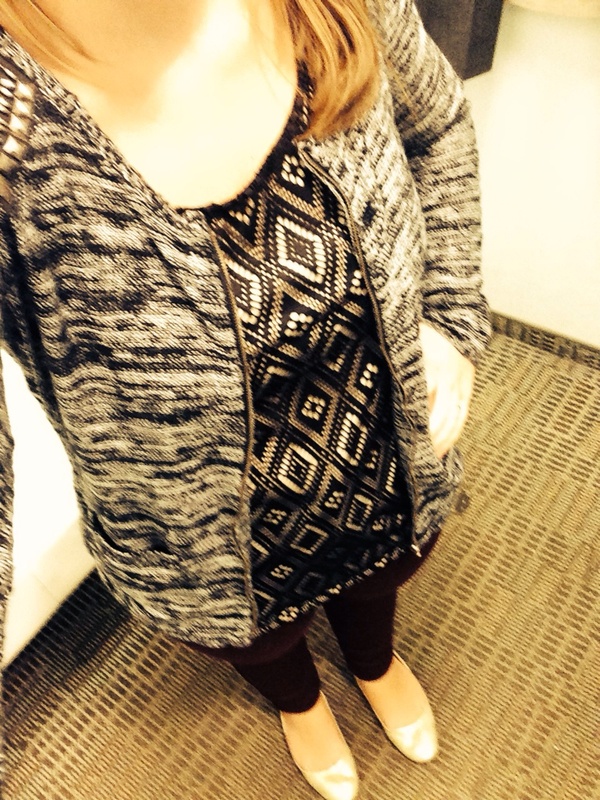 I am crazy about this zip front cardigan too. I love the black/white knit and the embellishment on the shoulders is sooo cute! I think this would be a great day to night look. You know, for someone who went out at night (aka, not me). But I would look fabulous at work AND as I sit on the couch watching The Voice and trying not to fall asleep! 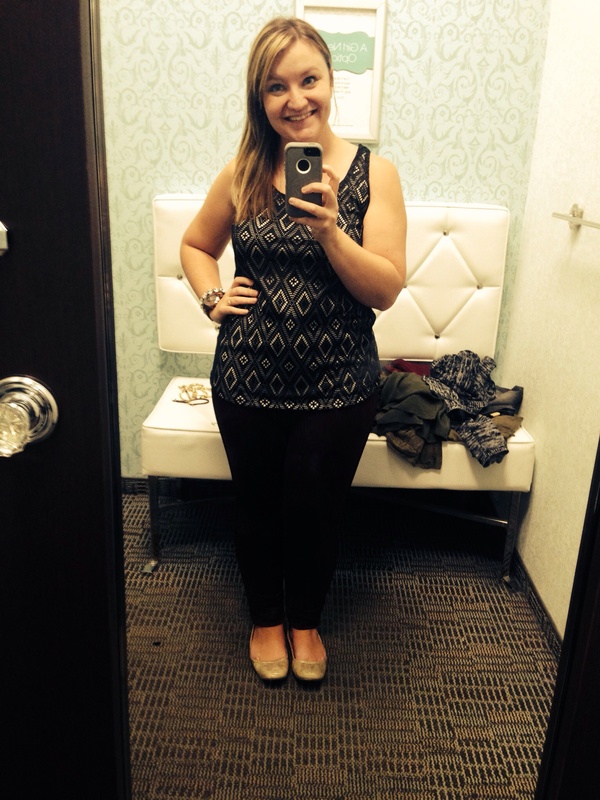 I tried them on with this cute olive lace tank (on super clearance now!) and the embellished cardigan (again). This outfit I liked less than I had expected. This jacket was cute, but just didn’t fit me well. Same goes for this simple flared circle skirt. 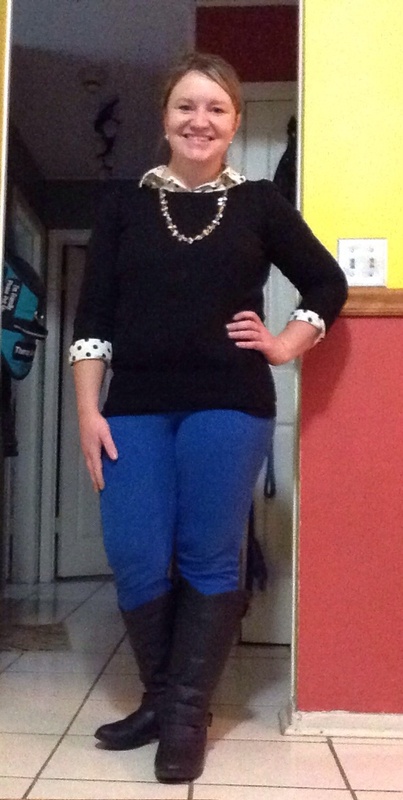 I liked the idea of this with black tights and black booties, but probably for someone taller than I am! Unfortunately the skirt is now sold out too, but you can find lots of other skirts here– there are some adorable print pencil skirts in there! Maurice’s currently has a BOGO 50% off offer in stores and online with the code SHOPFALL1014. 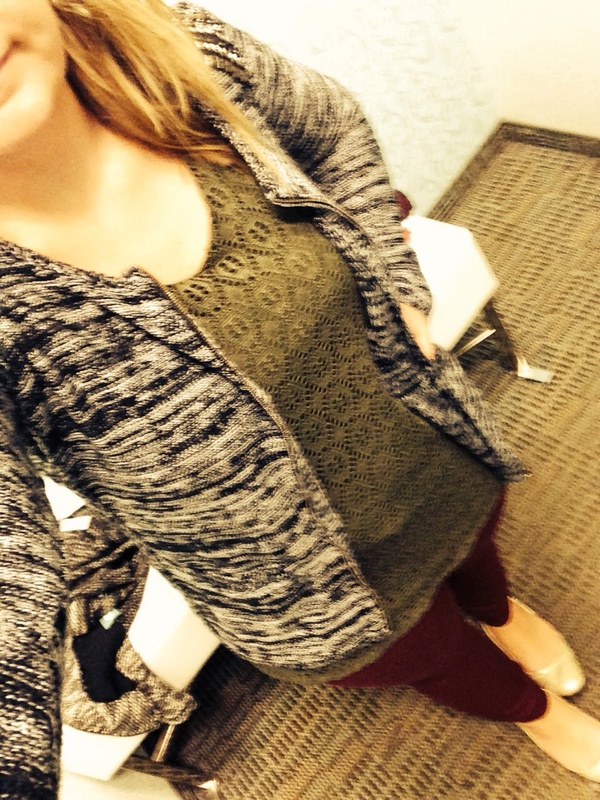 It would be a great time to try something new (like skinny knit pants and a great cardigan!). 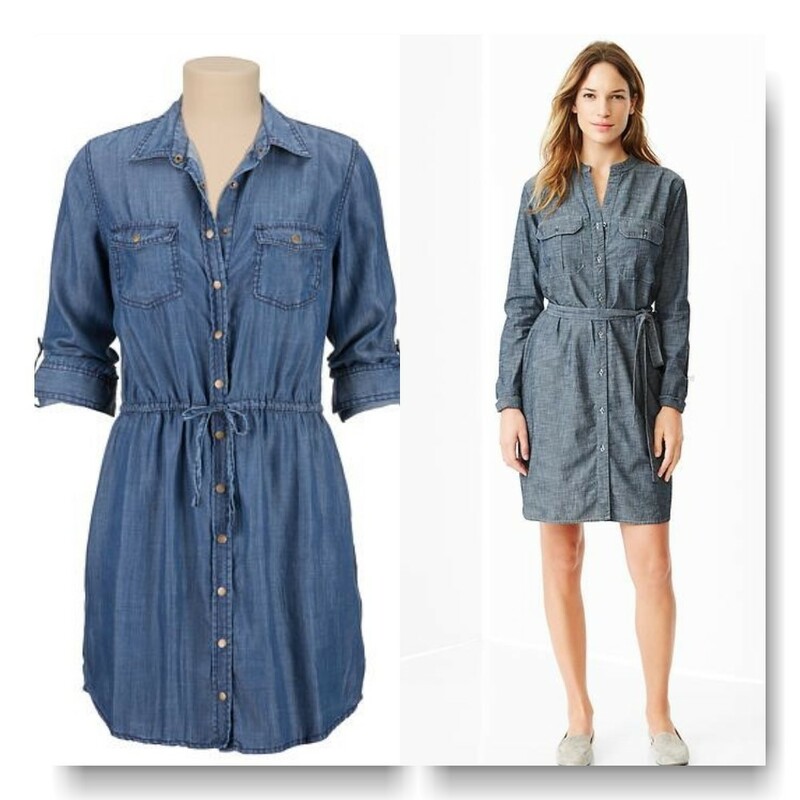 I started thinking about a chambray shirt dress when I read this blog post from Alison at Get Your Pretty On. 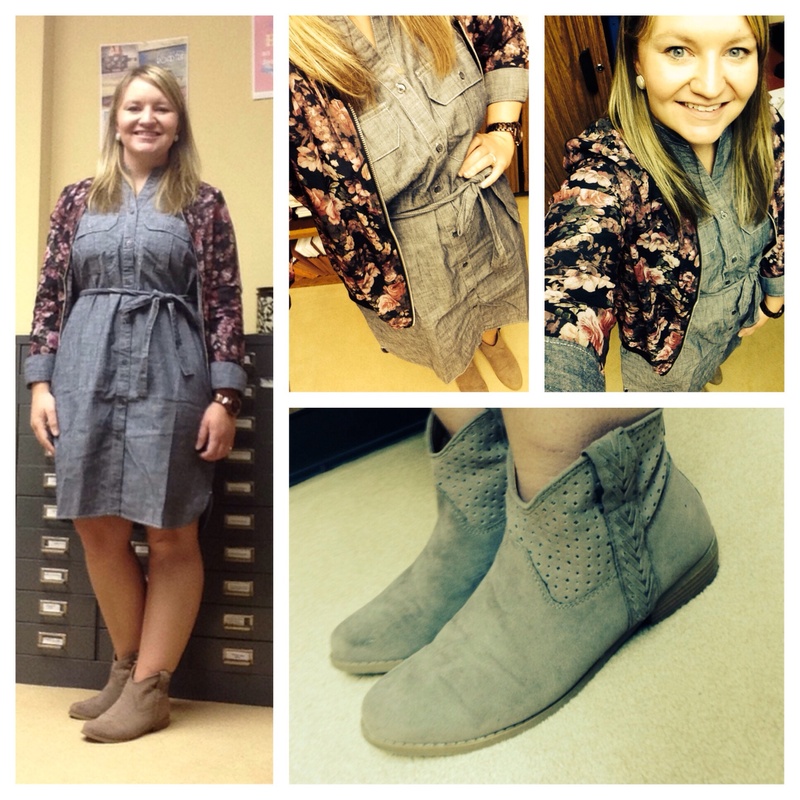 I love easy and cute and that seemed to be just what this dress is all about! Dressy enough for my office, but still casual enough for anytime. 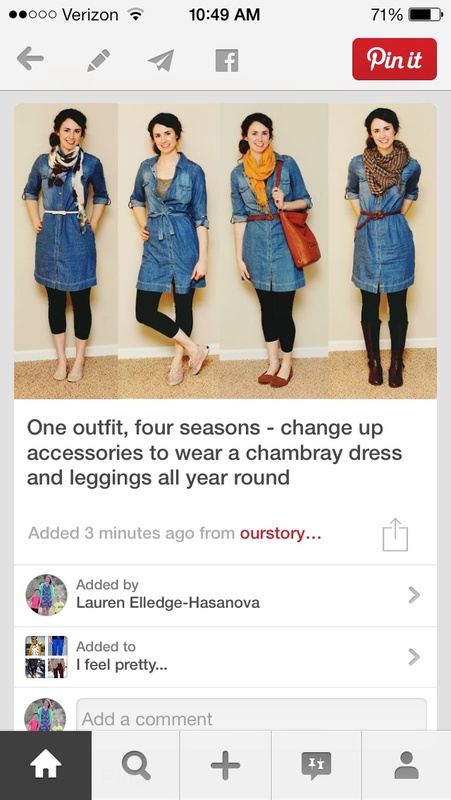 Of course, like most women I think, I went to Pinterest to be sure I would be able to wear it lots of ways with things in my closet. The answer was a definite yes! 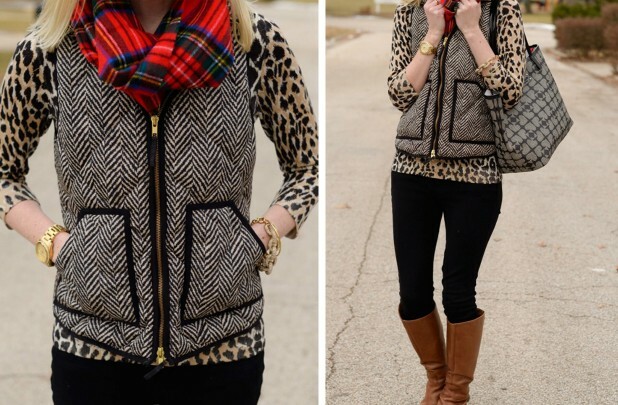 How cute is this for fall?! 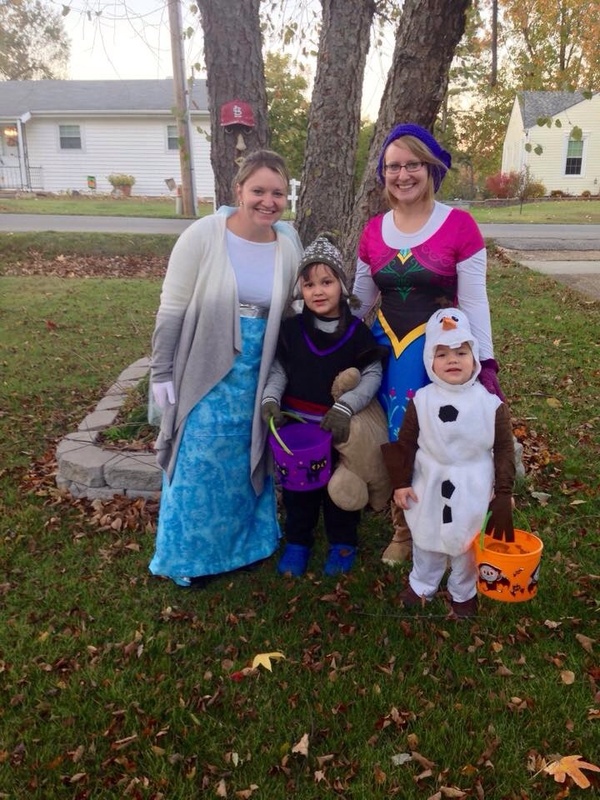 And…It works for all seasons! Next up was my search for just the right dress! I really only looked at two. 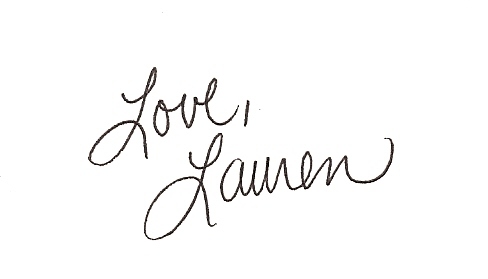 I found this one at GAP and this one at Maurice’s. I thought both looked really cute, but ultimately I went with the more expensive GAP option because I got a good deal during a 40% off sale and I liked that I could belt it or not and could remove the belt if I wanted to add my own. I also thought it looked a little cleaner and more polished, and since I planned to wear it to work, that was a must. I also liked that I could order a petite size from GAP. Here’s how I wore it the first go-round! I topped it with a floral jacket from Maurice’s, some tan booties (a few years ago from Target), and simple earrings and a watch. I thought it was a great office look, but could be casual as well. I’m so happy with this purchase and I’m sure I will wear it all kinds of ways in all seasons! The Style Challenge has come to an end and I’m kind of bummed. But, I’m also excited to use the new style tools I gathered along the way to do some fun stuff with my outfits. 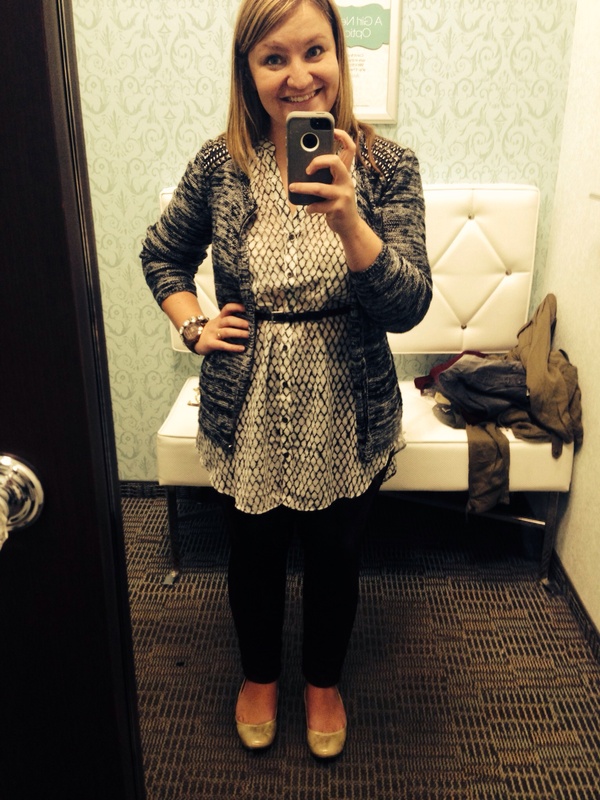 The challenge called for a cardigan over a sheath dress with a belt. I love this look! I felt polished and very put together. However, it was on this day that the heavens decided to open and it poured rain basically all day. I love looking good, but I hate being wet and soggy, so I had to change things up! The polished sheath dress look became a much more casual outfit! But, I loved this too! 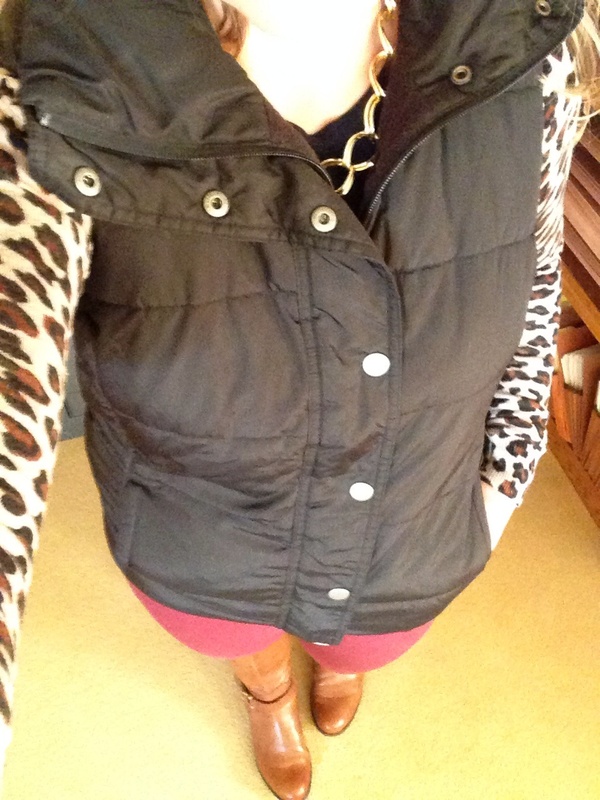 This leopard cardi is going to be my BFF this winter I’m sure! 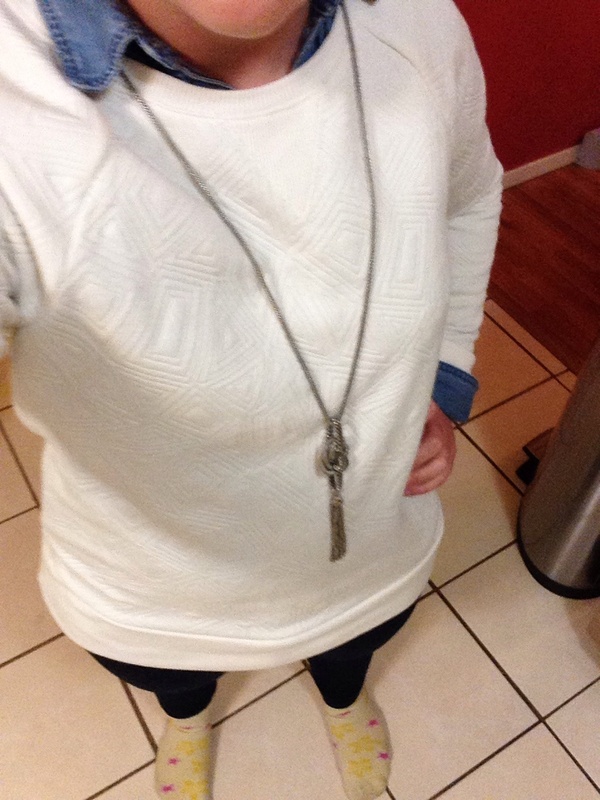 I layered it over a denim shirt and wore some skinny ponte black pants and ankle boots. I wanted to keep my cute layered necklace, but it was too much with the shirt and cardigan, so I switched it out for a simpler blue necklace. Cardigan is Old Navy. 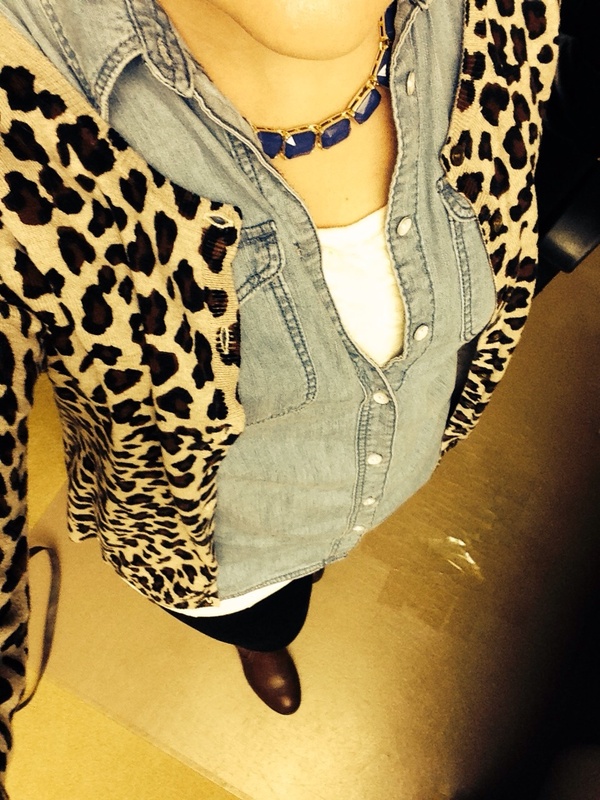 Denim shirt is JCP. 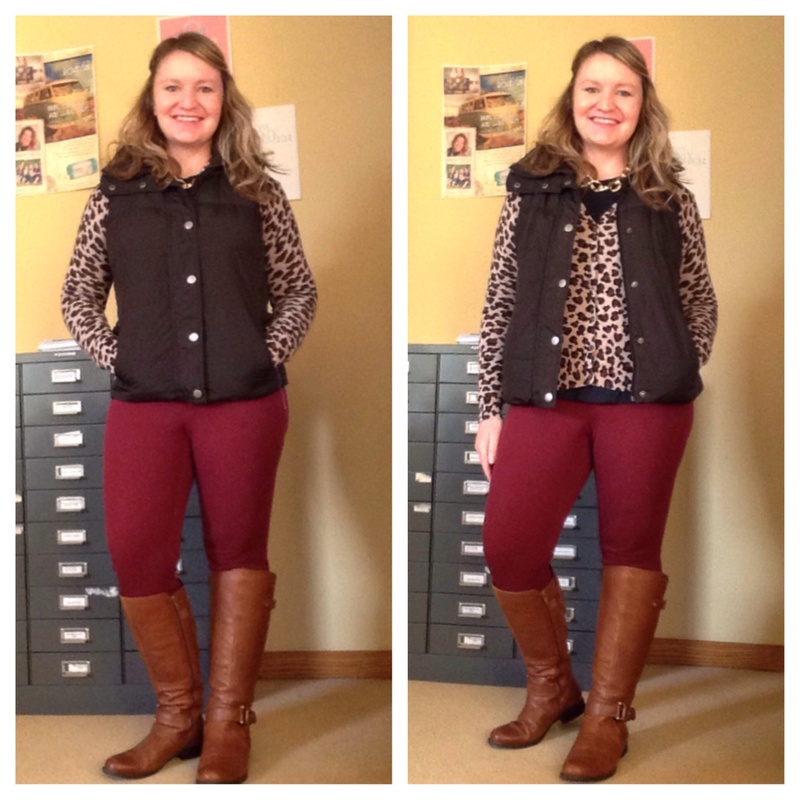 Black pants are Maurices (these are fabulous-SO comfy and skinny enough for boots with no problems, but a nice thick knit- they get tons of wear in cold weather!). Booties are from K-mart (I’m so proud of this fact! It’s not somewhere I shop much at all, but I happened upon these on super clearance this past spring and they are so cute!). Sheath dress is JCP. Colorblock wedges are Payless. Teal layered necklace is Charming Charlie’s and blue one is Loft Outlet. 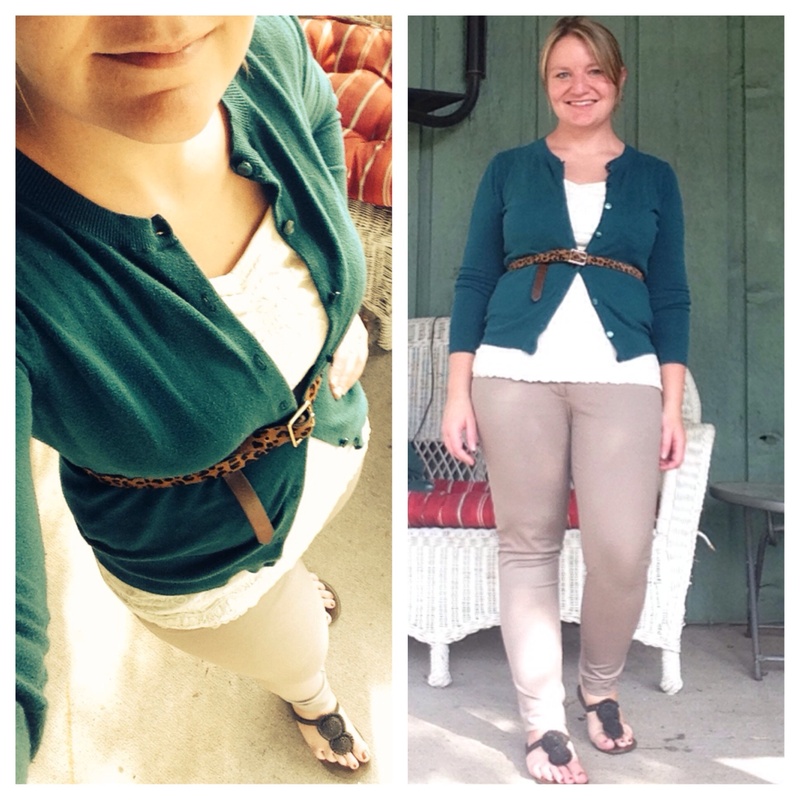 The outfit was supposed to be finished off with a blazer, but I loved my new khaki jacket with this outfit! I felt cute and put together but still casual. 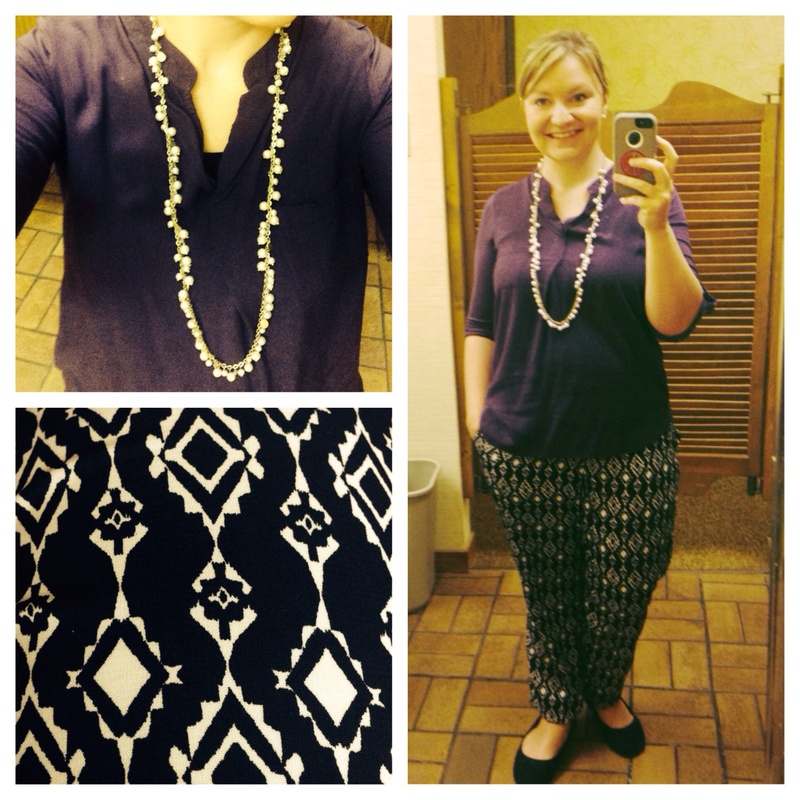 The necklace was the perfect pull-together piece! I need to talk about these jeans for a second. They are a few years old, but they are my old faithfuls! For a long time I stayed off of the skinny jean train because I have large thighs and just legs in general. But I tried these on and fell in love! They are the perfect length for me, fit perfectly (even when I’m a few pounds heavier or lighter than usual), and have a nice wash that’s always appropriate. They’re from JCP and I’ve never found another pair that was just right like these! My jacket was an impulse buy from Nordstrom (now out of stock). Mix and Match Mama suggested it and it was on sale for less than $30, so I went for it. It’s very cute, but it does have a few issues- it wrinkles really quickly/easily and the sleeves cuffs are huge. There’s elastic in the cuffs, but it’s gigantic around my wrist. I sized up since it’s a junior’s jacket, but that shouldn’t make the cuffs THAT big. It’s still cute and is something I didn’t have in my wardrobe, though, so I kept it. The sleeves are easily pushed up and I usually roll/push up my sleeves anyway, so it was fine. The top is Old Navy. 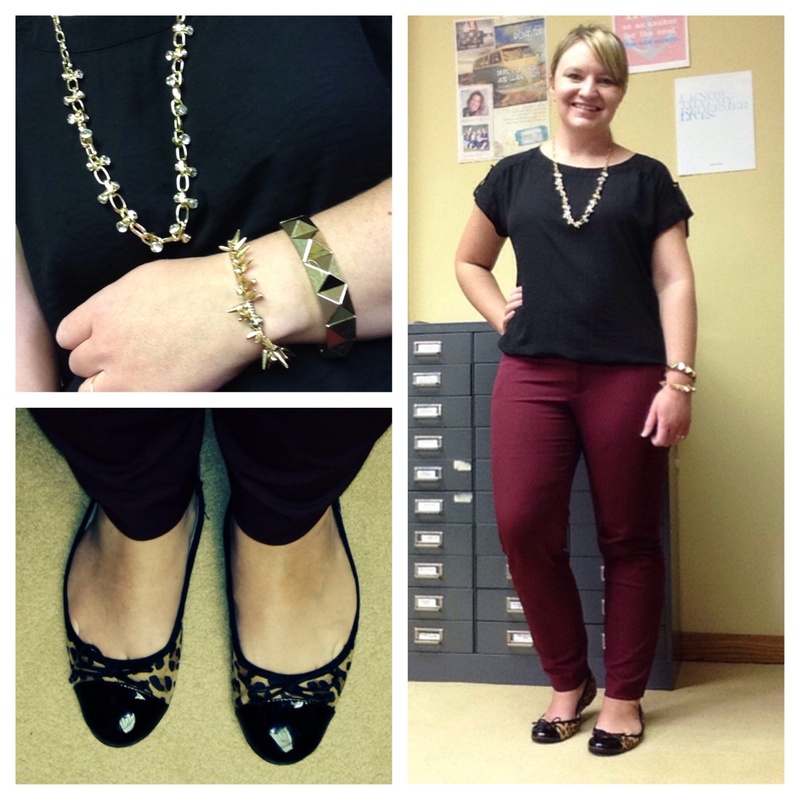 Necklace from Jane.com and leopard flats from Target. I pulled out some pieces I hadn’t worn in a while during the challenge! 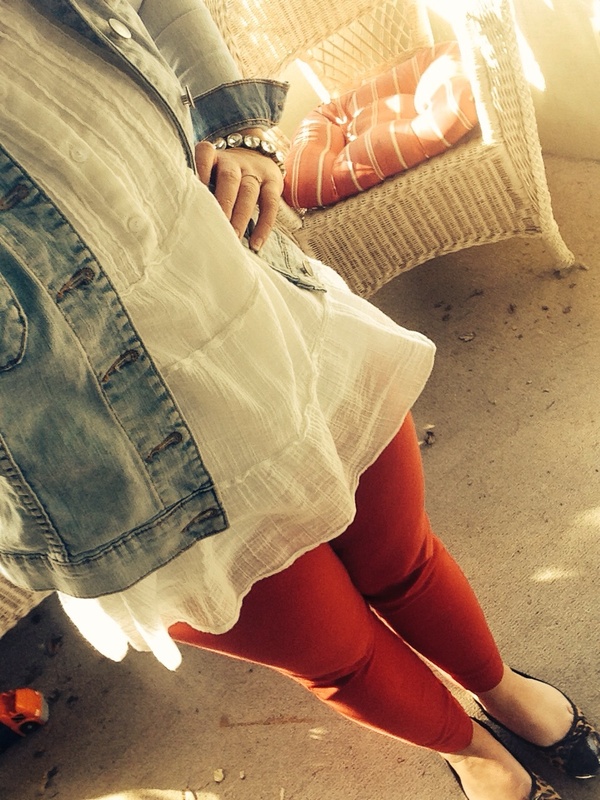 I liked the soft flowy top with my bright skinny pants and structured denim jacket. 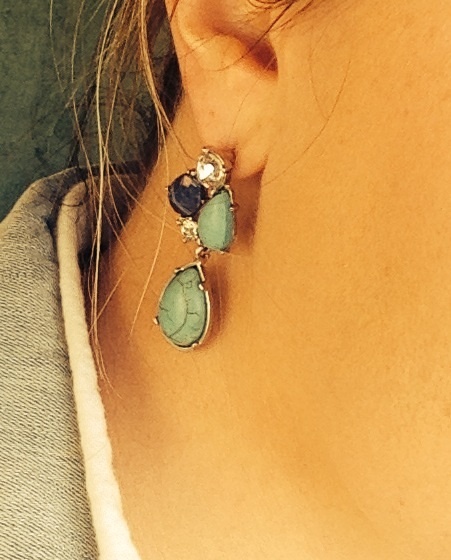 I also couldn’t wait to wear these fun earrings! The colors weren’t something I’d normally put together, but I liked the pop. 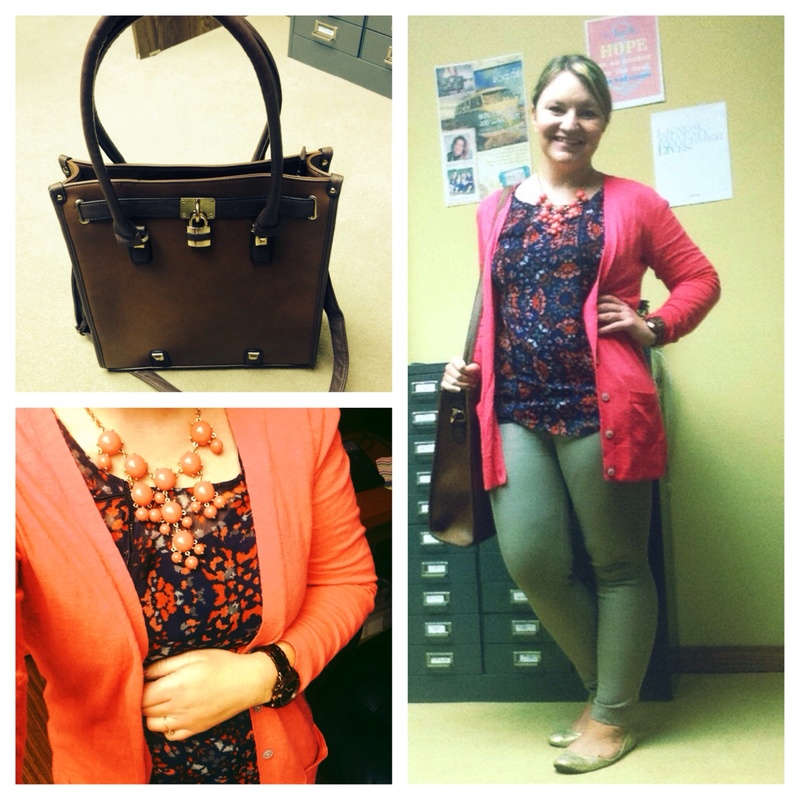 Top is from Maurice’s this past spring, shoes are Target and earrings are Charming Charlie’s. My denim jacket is Kut from the Kloth last year. Here’s a jacket from this year. This year’s colors are different and I like them (but honestly, I like mine more!). I never though of a denim jacket as an investment piece, but I’ve gotten so much wear out of this thing, it’s crazy, and I’ll be wearing it tons this fall/winter too! 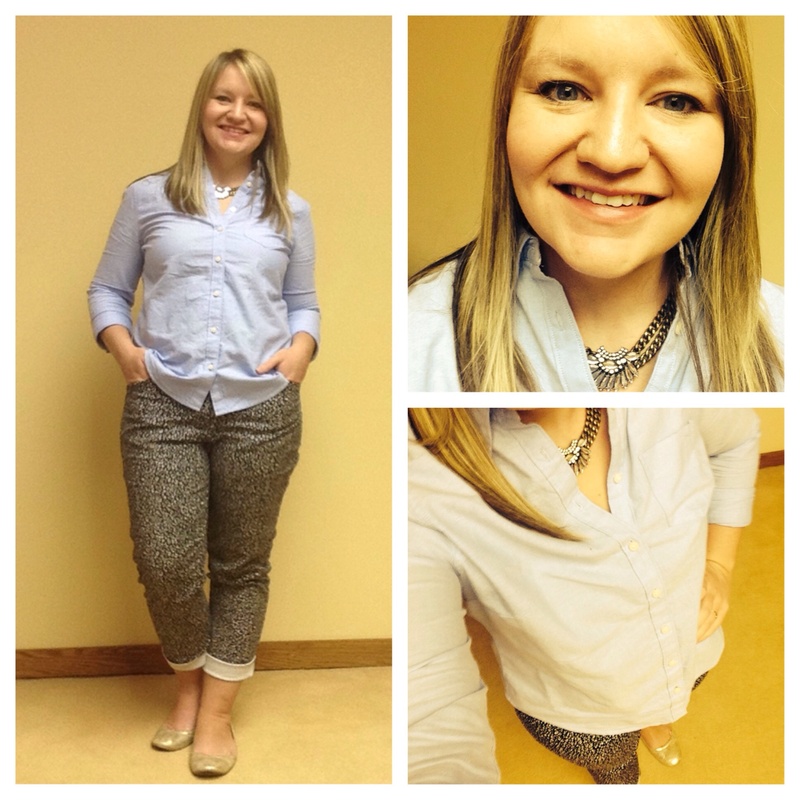 Pants are Old Navy pixie pants and they’re my fave! They are on sale for $25 right now, so if you don’t have any yet, this is a great time to buy! I was running late, so I pulled out a challenge outfit! I went heavy on the pink and loved it! Also showing off my new cognac tote bag from Call It Spring. I got it on sale at an outlet this past weekend and I’m loving it! Thanks for journeying through this little challenge with me! It’s been fun! I am SO ready to start the fall challenge! Sign up starts soon and the challenge will start in October. I’ll be sure to update my blog with the information when the time comes! 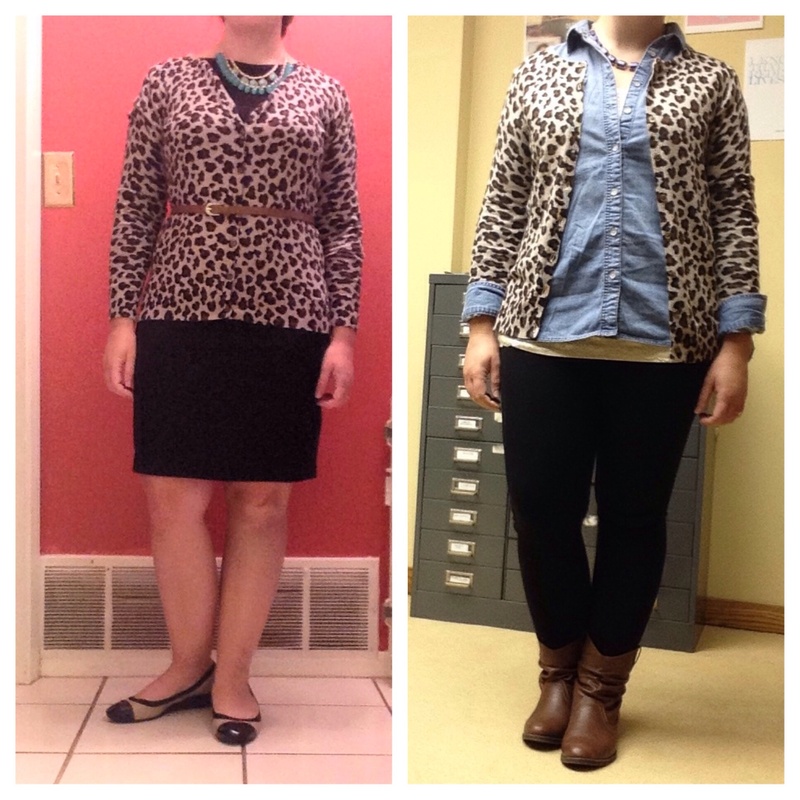 Also, be sure to check out my fellow Work Wear Challenge Bloggers’ last few outfits! 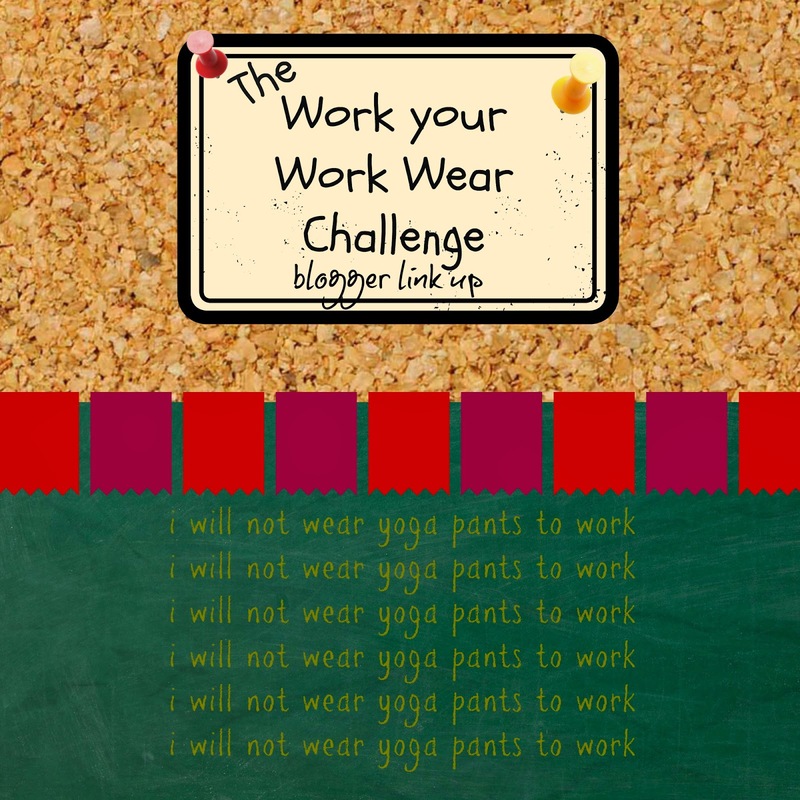 Work Wear Style Challenge Week 3! Unfortunately the full body pic is really unflattering! But, overall, I think this was a cute outfit. Still need to play around with the belt over clothes thing to find the most flattering placement. It was SO hot last week, so I had to replace the recommended white button-up with a lace cami. I should wear it more often! It’s so cute! Could have upped the accessories on this one too. All these items were older purchases. I loved this outfit! 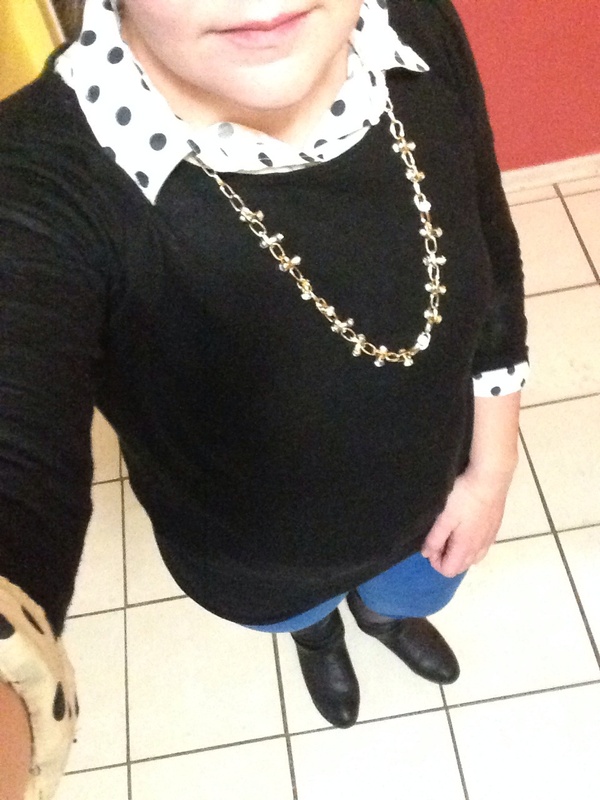 Mostly because I finally got to wear this adorable polka dot button up from Old Navy! I LOVE it! I got it for this challenge. 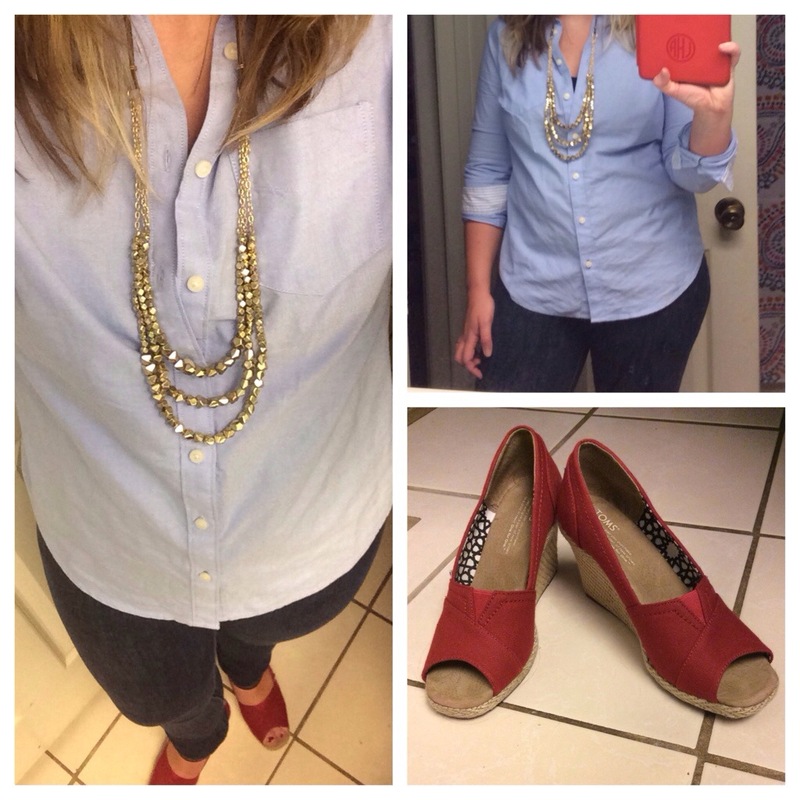 I wore some Maurice’s jeans, leopard flats from Target and a tassel necklace from H&M. Perfect casual Friday look! I went off-challenge on Day 11 and drove up to St. Louis to spend the day with one of my college roommates! So much fun! It was a BEAUTIFUL day and we spent most of it outside at the Missouri Botanical Garden and the Arch. I did wear a challenge printed top and bright cardigan (till it got too warm). 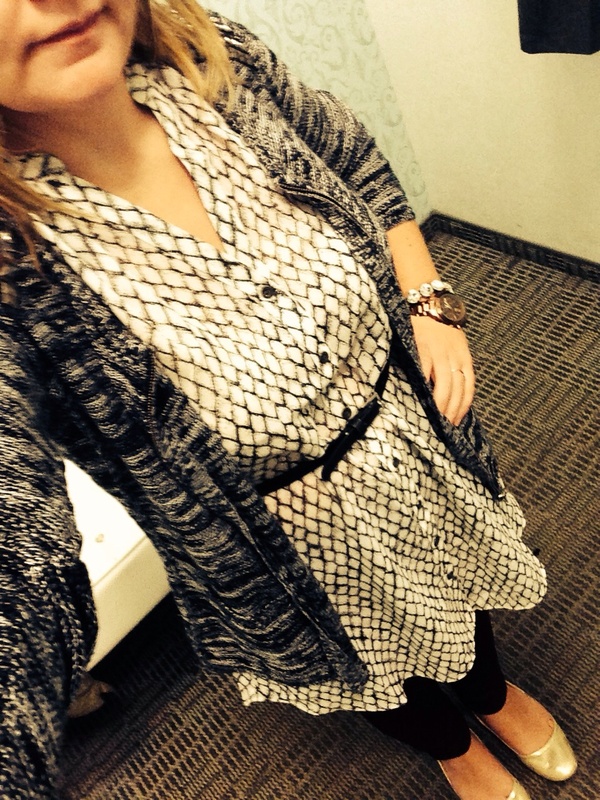 I really changed things up from the suggested outfit today, but I got the basics- black, color, and pattern! I like how the jewelry really dresses up a pretty basic outfit. I blinged myself out today and I like it! My pants are new from Old Navy. They are pixie ankle pants and they are my favorite work pants right now! I have 4 pairs- all in different colors- and am already thinking of what other ones I need! They are comfortable and stretchy but also really cute and professional. My top is from this summer at JCP and flats are from Target. Bracelets are from boutique sites and necklace is Charming Charlie’s. It was a fun week of outfits! There are just a few left, but I’m already excited for the Fall Challenge! 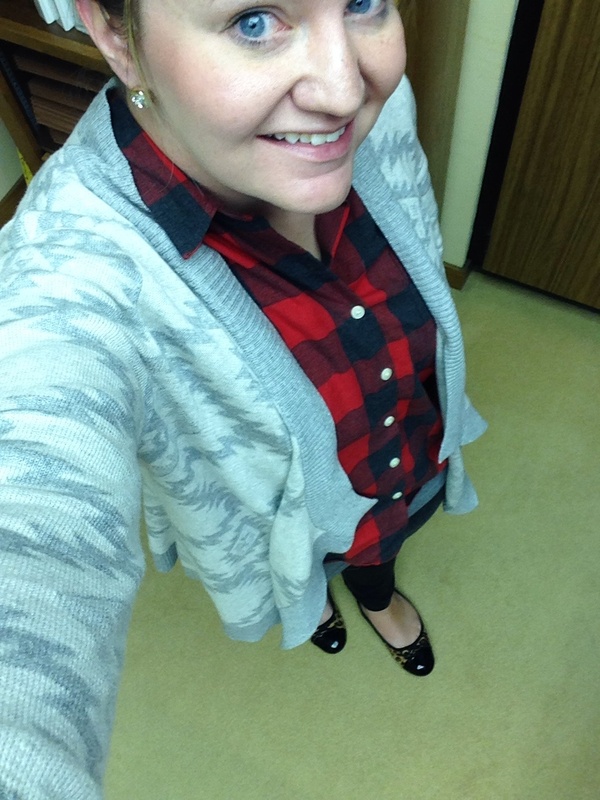 Fall is definitely my favorite time for clothes- boots, sweaters, scarves, etc. I love it! I’m definitely hooked on these challenges! 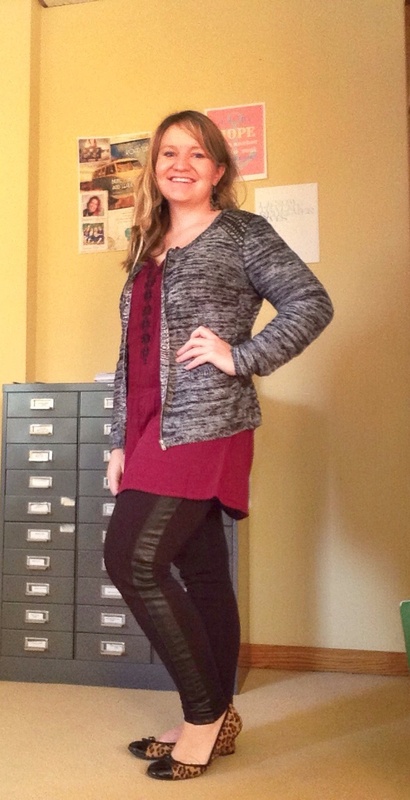 Make sure to check out how other bloggers styled this week of outfits! I had great intentions of posts in the past week, but travel over the long holiday weekend meant it just didn’t happen! I was off on Friday and Monday, but I just missed one outfit. Here’s what I wore this past week! I just loved this outfit! 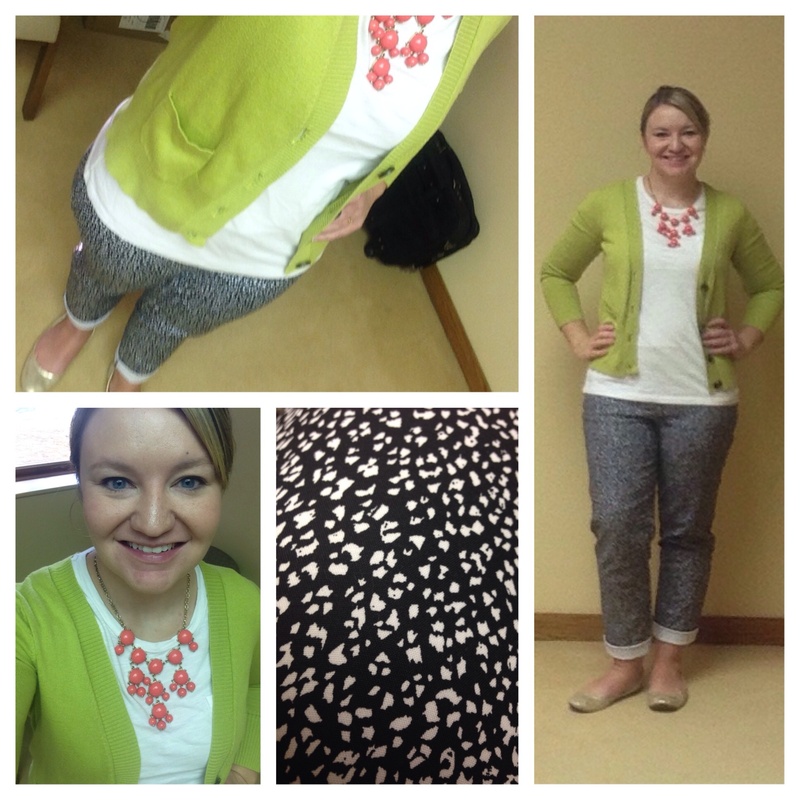 The colors and graphic print pants made it fun and playful, but still professional enough for the office. The pants are from JC Penny. They’re a recent purchase, but were on clearance so I can’t find them online. 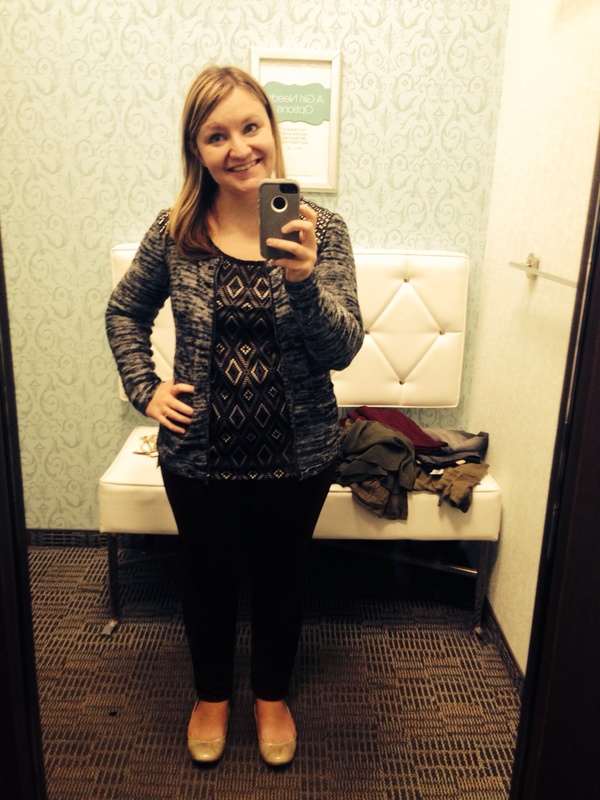 My cardigan is from last year, but I saw this one, also at JCP, and it’s very cute. Shoes are Target (now sold out online) and I really don’t remember where the necklace is from! I decided to play with this look one night since I missed it while traveling! 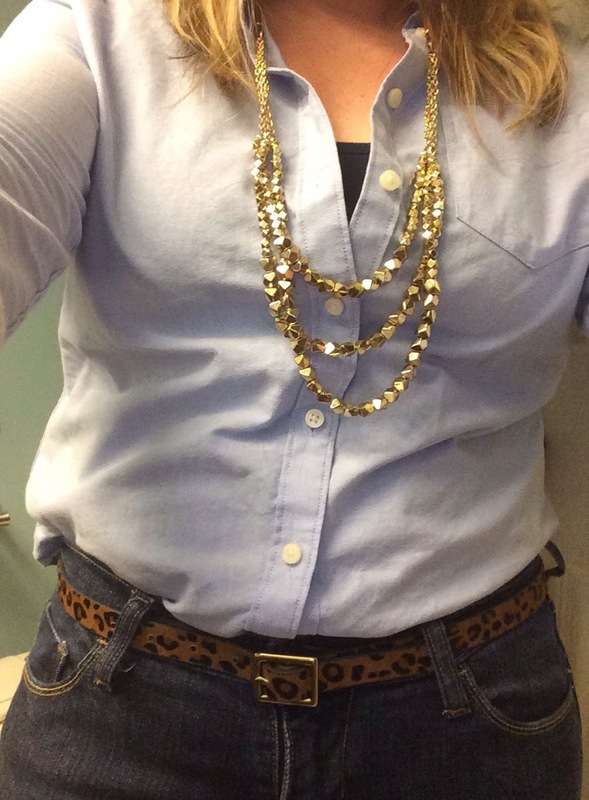 I had kind of a hard time with the shirt, since I wanted to show off my leopard belt and not my muffin top… I do like the preppiness of this outfit, though, and my super cute Toms wedges! Top is from JCP, everything else is old! I love this top! 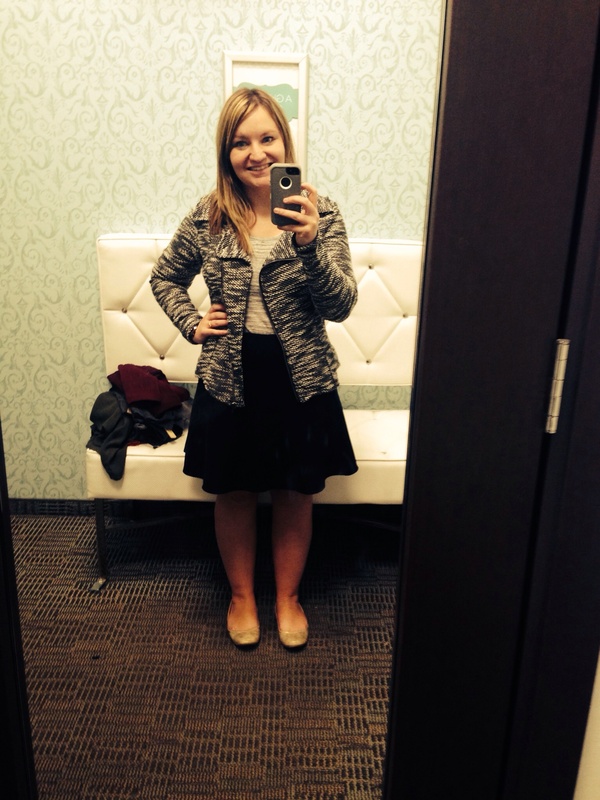 I fell in love with it at an Ann Taylor outlet last year and actually waited for a big sale to buy it! I just think it’s such a classy print and it’s super flattering. I don’t have to dress it up much since it’s already an attention grabber. I also have a special love for my tassel necklace. I saw them everywhere last fall but most were really expensive and I just couldn’t justify it. I like to go fun and trendy and inexpensive in my jewelry (for the most part) so I’m not out tons of money when trends change. 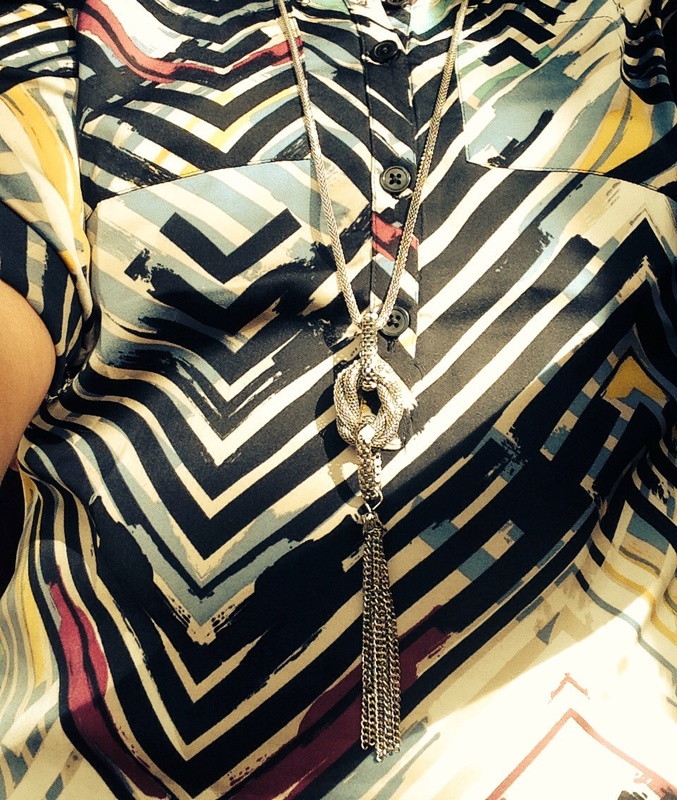 Then I found this cute necklace at H&M for $8! Perfect! I’ve definitely gotten my money’s worth! Shoes are Payless and pants are Maurices. Not sure if those are the exact pants, but they’re pretty close. And FYI, Maurice’s has great pants and jeans! The lengths go from x-short to x-tall. For someone who often has to hem pants that are short length, this is awesome! They’re usually my first stop when pants shopping! I pulled out my summer favorite, printed joggers for today. These are from Maurice’s and are now sold out, but I love these pants! They are fun and different, but also really versatile. 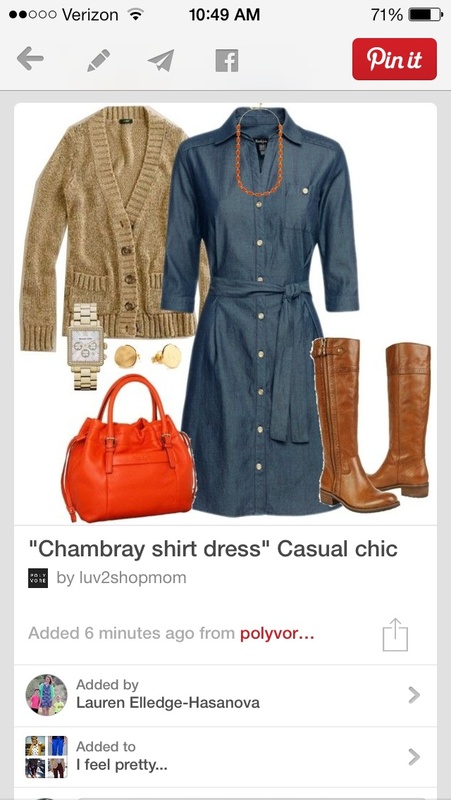 I wore my Pinterest Told Me To “Must Have Shirt” (linked to the new version- different colors, but the same basic style. It really is a great top!) that I got last summer from Nordstrom with it, plus some fun pearls and black flats. Overall, I’m not in love with this look, I think there’s too much flowiness going on, but, I do feel like I am in my pj’s so that’s kind of nice! So, week 2 is in the books! Days 4 and 6 are both faves this week. 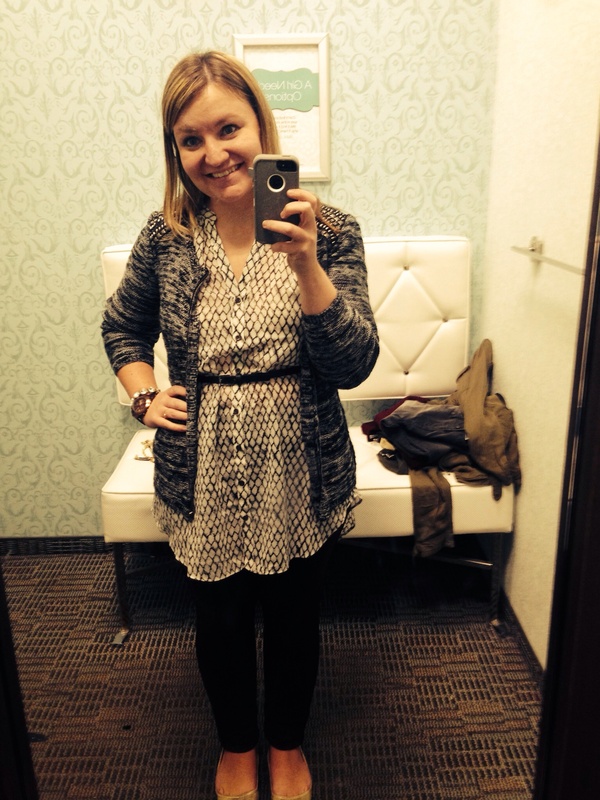 Thanks for stopping by and be sure to check out some other ladies’ looks!